Wherever you're standing, sitting or lying down right now, there's a pretty good chance the space beneath your feet has a little bit of history in it. But it's not very often you actually think about it, is it? The people that have walked across your train carriage, the things under your floorboards, the grass left to grow in your local park. Directly underneath the desk I'm sat writing this at in Battersea are a load of swooping arched vaults. They once housed barrel after barrel of beer ready to be shipped out from the yard at the back of my office by horse and cart. Although the vaults are now filled with vases and props for a floral display company, there are still a fair few barrel-shaped markings on the wall that show the past is there, and that history as it's told did happen. From 1801 to 1924, the site of Foodism's HQ on Wandsworth Road in Battersea was a brewery. First called the Clapham Brewery and from 1868 the Plough Brewery, it was a cornerstone of the local community, from which regular deliveries of casks and bottles would head out past the recently built terraces and the yet-to-be-built 1970s estate, giving beer to the people of London. From 1868 to its closure and sale in 1924, the brewery was operated by a Kennington-based brewer called Thomas Woodward, and later his son. While the railings at the front of the building still bear the initials of Woodward, the interiors of the brewery building he built have changed completely, and his history confined to a couple of old postcards, as well as some badges and pump clips that nod to the kind of beer that he made. Until last year, that is. To commemorate 150 years of the Plough Brewery, the Clapham Society and the building's owners (and our landlords) Marston Properties unveiled a green plaque commemorating the building's history. Which got me thinking: why had I never noticed the brewery entrance I walk through every day? As a pretty enthusiastic beer drinker, and someone who writes a fair amount about it, too, why had I never connected my office's address – 5 Tun Yard – with its beer-producing past? And as someone with increasing connections to some of London's best brewers in the present day, why had I just let this history lie dormant underneath my feet? That's when I decided to seek out our nearest brewer. And it was one I already knew well: Mondo Brewing Company. Located just half a mile from the old Plough building on Stewart's Road in Battersea, Mondo is a little bit younger than T. Woodward & Sons (having been set up by American brewers Todd Matteson and Tom Palmer back in 2015, during the second wave of London's craft beer boom). Early discussions with the gentle and personable Matteson didn't prove difficult at all – he'd walked past the Plough Brewery many times, and had even thought it'd be fun to work up a heritage recipe to brew at Mondo. We were on. With the green light to get brewing, we used a primer on the brewery's scant history alongside those old postcards, plans of the building and antique pump clips to work out what Thomas Woodward would've been brewing in Battersea in the 19th century. 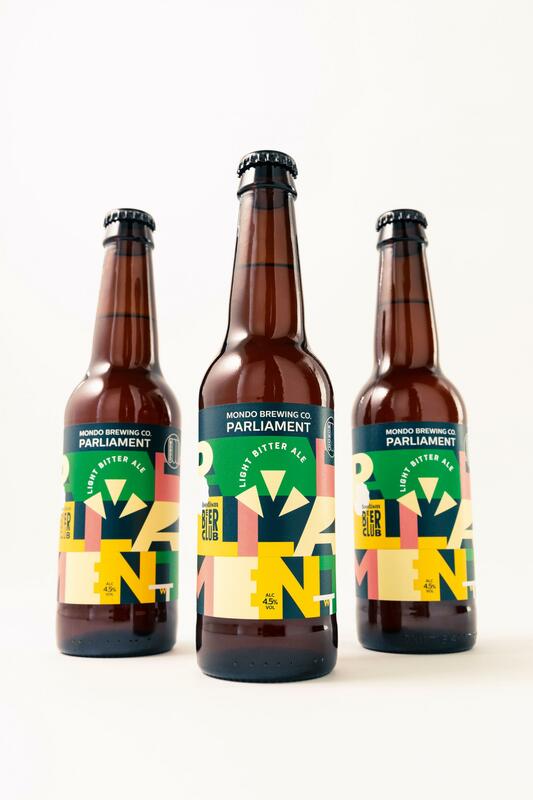 The results were varied, and some of them quite recognisable to beer drinkers today: a bitter ale, an oatmeal stout, a light bitter ale and Parliament Ale – likely a strong, wood-barrel-aged stock ale designed to be kept and drunk during the winter months. With stouts and regular bitters still a mainstay on pub taps all over the UK, and stock ales like Parliament being a huge, time-consuming investment for a first-time project, we opted for the light bitter. The name Parliament, though, would remain: partly due to the tie to Woodward and London, and partly due to Mondo head brewer Tom Palmer's love of the George Clinton-fronted American funk collective Parliament-Funkadelic, it was to become the name of our collaborative brew. So, with a style and a name decided on, we needed a recipe. And that's where beer historian Ron Pattinson came in. From his home in Amsterdam, Pattinson devotes about 30-40 hours of his time each week to scouring brewing logs and historical records for beer recipes of the past. What distinguishes him from most beer historians, though, is that he researches the beers themselves, rather than the breweries that made them. As a result, he's worked on heritage recipes with Fuller's, Goose Island, Wimbledon Brewery and Truman's to name just a few. "Light bitter ale can be traced back to the 1840s, when people were after a weaker, 4.5-5% alternative to the original bitters," says Pattinson. "These beers would've used simple ingredients: pale malt, invert brewing sugar and flaked maize." "How do we approach a beer that's both traditional and modern?" mused Mondo's head brewer and co-founder Tom Palmer, who was charged with finding the requisite ingredients to create a modern interpretation of Pattinson's recipe. "For the hop schedule, Ron dropped some more knowledge on us," he continued. "Light bitters would've used very traditional English hops like Fuggles and East Kent Goldings for aroma, but most of them were actually bittered with a US hop called Cluster." Luckily, Palmer could track down modern versions of all of the ingredients Pattinson advised, including "a heritage malt called Chevalier. It's an older style of two-row barley, and was close to the kind of barley used back in that period." Neither the brewing team at Mondo nor I knew this, but UK brewers had been using Cluster hops as early as the 1820s, and by Thomas Woodward's era Cluster accounted for 96% of the hops grown in the USA. With the dependence on US hops for flavour and aroma in modern beer, there was something pleasing about two American brewers and one British writer discovering that the relationship between the US and the UK in beer is a hell of a lot longer-standing than just the last decade or two. With that in mind, we descend on Mondo's brewery on a deceptively warm day in early February, Pattinson dropping in from Amsterdam, the rest of us sidling down the road in the dazzling sun just in time for mash-in. Palmer slashes open the bags of malt, hauling them up and pouring them into the mash tun one by one. The day is a resounding success, and seeing the techniques and the ingredients up close only fortifies the excitement we all feel about the finished product. We all chew a sample of Chevalier malt, Ron pours the Cluster hops into the boil kettle and we talk about the recipe over a beer in the brewery's taproom. The chat is a reminder, though, that Cluster's fate is not so good as its other more popular US cousins like Citra and Mosaic: the hop's acreage has seen a steady decline since the 1970s, to the point that Mondo had never heard of it or used it in all their time brewing. For me, this project suddenly shifted from being simply about rebirthing a modern take on a beer lost to history – it was now about a beer celebrating ingredients that had fallen to the wayside over time, too. That theme is repeated in the use of both Chevalier malt and Whitbread yeast – both of which were staples of brewing in the 19th and early 20th centuries, but which would have disappeared entirely without dedicated purists working to keep them alive, be it in a scientific lab or a few small fields in Norfolk. Meanwhile, a week or two after the brew day, I go and see our beer being put in casks – the first time a Mondo beer has been made this way in more than three years – and left to condition with priming sugar and finings. Two thousand litres of Parliament has been brewed overall, divided between bottles, kegs and casks (the latter of which is arguably the best fit for the style). And – perhaps due to the manic preparation of deciding with Mondo where those bottles, kegs and casks are going to go – the next couple of weeks flies by, and it's not long until it's time to make my way back to the brewery for bottling and, more enticingly, a first taste. This is where the scope of what we've done hits home. After we peruse the bottling line – the vibrant typographic label designed by my colleague Annie Brooks dazzling as it's wrapped around each bottle before the liquid goes in – the delicate, bitter and slightly citrussy liquid is met with smiles as we taste it for the first time. Palmer can't help but grin as he glances over the packaged kegs, casks and bottles ready for shipment to venues around London – at the taste, first and foremost, but over the sense of achievement, too. "The water is different, the ground is different, the air is different, so most certainly the flavours are going to be different from the 1800s," he says, "but capturing that essence and doing it accurately and sincerely is what we did. 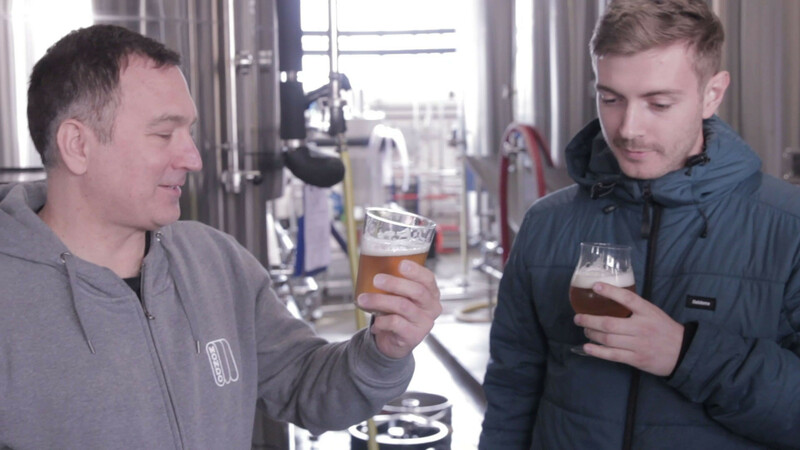 It's been a really great way to find our way back to cask beer as a brewery." 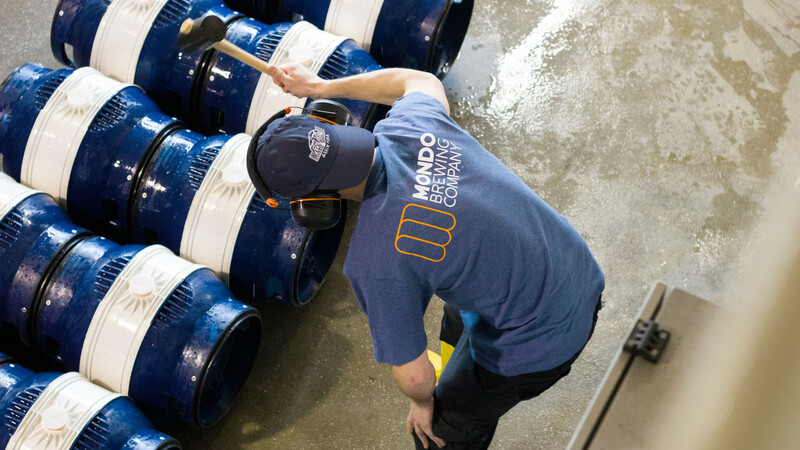 And having found their way back, Mondo is now looking forward: there are plans in place to put a certain amount of their beers in cask at the Battersea taproom each time they brew – flying in the face of declining cask beer sales across the UK. And that's when I realise this isn't the story of one brewery, but two: not just the historic one under my feet, but the relatively new one down the road, too. The mark of Woodward's old brewery is now not only on a set of railings outside my office and a plaque that harks back 150 years or more, but the project it inspired is also immortalised with a painted brick on the wall of Mondo's taproom. 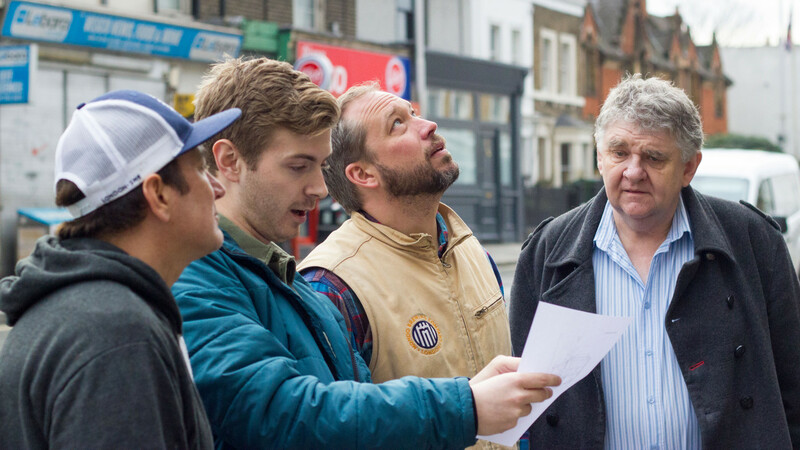 Despite being separated by more than a century of London history, T. Woodward & Sons and Mondo Brewing Company have found kinship in the present day. And a project that started off as an exercise in curiosity – of trying to map the history of the place I work – ended up as something much more meaningful.